Saying I'm intrigued might be an understatement. Smoky rum. Hmm, isn't that Batavia Arrack??? Just kidding! If i see it and it doesn't break the bank I might try it. Not overly optimistic on either point though. 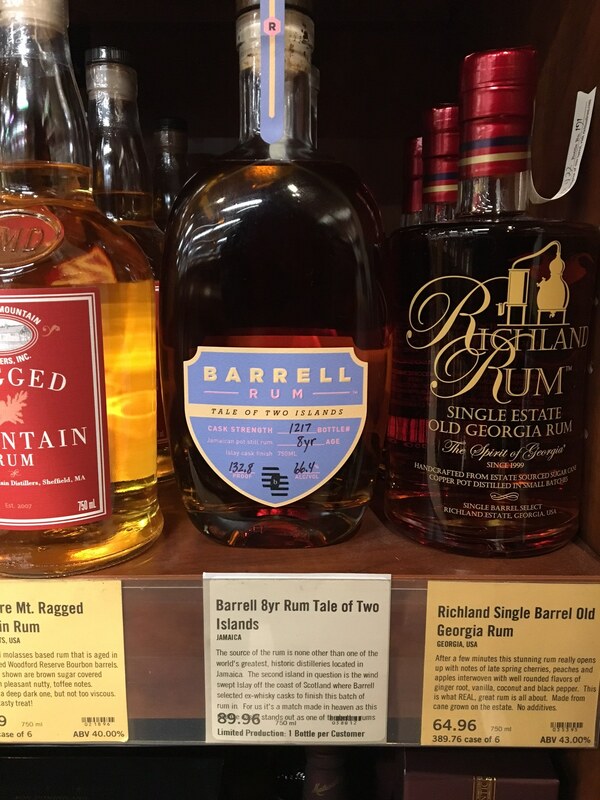 I passed up the last Barrel rum a few times and by the time I reconciled paying the asking price it was gone, if this one shows up somewhere I know where my local post office is. I’m in the exact same boat. I was highly skeptical when they released the first rum batch and by the time I heard positive reviews, it was gone. Anyone have any updates on when this is happening? K&L got some in stock on Friday and it seems to have sold out almost immediately (or at least before I had a chance to buy). Not sure how many bottles they received. I was watching when they got it in, it was either 6 or 12, I can't remember which but it wasn't much. This bottle intrigues the hell out of me. I grabbed 2 online, now we play the waiting game. $90 for an 8yo Jamaican aged in Islay (as if they simply bought a barrel off of one of the independent bottlers in Scotland that already do that) sure does steep. The K&L Enmore is more than 3 times the age but barely 2 times the cost. Feel like I would have to try this to make a decision but by the time I do, if I ever do, it will of course most likely be gone. I agree the price seems steep for what it is. I would have preferred to buy the original 7yo Jamaican rum they put out that wasn't finished in a scotch cask, especially since it was $20 cheaper IIRC. Like you I'll probably waffle on this until it's all gone. Indecision is the only thing that spares my wallet these days so that's not a bad thing. kpiz, when mine shows up, if you waffled too long, feel free to contact me and swing into my area to grab a taste. Well, it looks like the Force got me. This showed up locally and it is either buy it now or buy it never. Most likely I will go with the now option. Looking forward to hearing your thoughts gentlemen. I had a chance to taste it tonight. A small sample that did not convince me to plunk down the $85 plus tax price. It was pretty dry with hints of phenol that made it seem a little confused. Interesting, but not overly attractive. Barrell 1 seemed more focused in its expression of rum character. This coming from a guy that likes peaty scotch but did not like High West Campfire. I'd like to hear what you think of it. My sample was at a local bar, and only the smallest of drams, which I split with the ever-lovely Linda. Could be more time with it I might show better understanding of where it was trying to go. Admittedly I tend to find things some other people find to be off or disjointed interesting and even enjoyable, I'd still like to give this one a try if I see it. What was the source on that Cadenhead's? Gah this reminds me that I need to open that Cadenhead's bottle. So many good bottles, so little time! For what it's worth (maybe not much), I get a tarry, chemical-like flavor from some molasses-based rums that come off a bit smoky or even peaty at times. I remember years ago having an old Ardbeg Scotch that had an aroma of walking down railroad tracks on a hot day. Creosote, tar, and such an earthy depth it was fascinating. They were using some real deep peat at the time and it was intense. I know what you mean about that aroma. It comes off as diesel fuel in a way. As long as there's something else going on with it I'm ok.
Linda doesn't like that funk at all. Even when I blend it down she still won't drink it. popped the cork on this tonight. It is shocking and fascinating. It is incredibly flavorful and shockingly smooth for the proof and I had no issue sipping neat. I tried it neat, with a few drops and with a cube. The nose is incredible in the weirdest way. The funk is still swirling around my apartment with a heavy rotten fruit component in a great way. The smoke is not incredibly similar to a peated scotch nor very powerful. It smells like someone someone down the block has a smoker going. The palate reflects the nose. it is very sweet, but not sugar sweet, very much overripe fruit; maybe baked apples with some burned butter. Plenty of funk comes through and the smoke is less present than it is with water added. The smoke brings some dryness mid palate, its not a peat smoke flavor, more hardwood charcoal. These notes are disjointed and unsure but this is so interesting and I'm still not quite sure what I tasted. To me it's worth chasing one down for the experience alone, but, I like this. Not even close to a daily drinker but this will be one that can scratch an itch no toher liquor I have will be able to.